Snuggled up against the base of Carson Mountain, Silver Lake is home to the oldest “fishing retreat” in the region. The Silver Lake Resort first opened along its northern shores in 1916 and has been hosting anglers and their families ever since. Folks from all over California and the West have been visiting Silver Creek for generations. That’s why the owners of the resort, the Jones family, don’t feel like they just host guests each season; instead, they welcome back family. “A majority of our customers, we know them by name and greet them with a hug when they come in. We want to make all of our customers feel like part of our family,” said Gary Jones. Gary first bought the resort in 1977, and is now part of the three-generations of his family to help run it. The natural lake covers 110 acres and is popular with boaters, shore casters, swimmers and kayakers. Exceptionally well-stocked, Silver Lake is known for having a very healthy trout population and for being popular with folks of all ages. 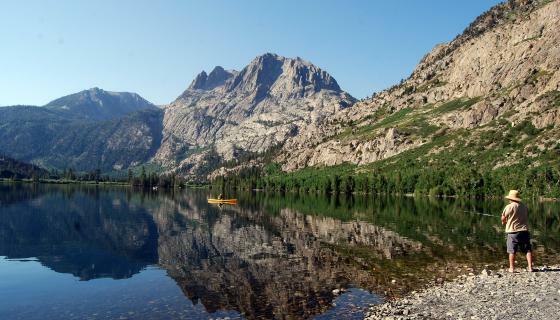 Directions: Located on Highway 158, about halfway around the June Lake Loop that leads to and from Highway 395. 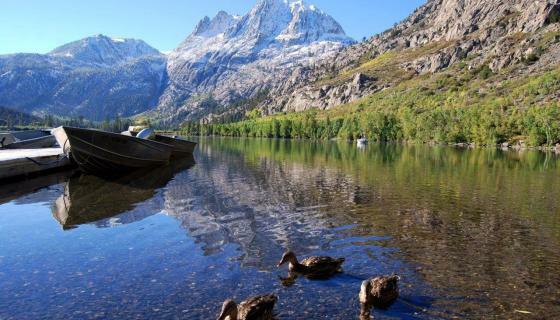 Silver Lake Campground is located just to the north of the lake along Rush Creek in the Inyo National Forest. There are 63 campsites at this high elevation, (7,200’) location. Reserve a spot at recreation.gov or call 877-444-6777. Silver Lake Resort offers cabin rentals and full RV sites just across the street from the lake. For more information or to book an RV site, go to silverlakeresort.net or call 760-648-7525. Silver Lake is known for having regular visits from black bears, so food must be stored properly. 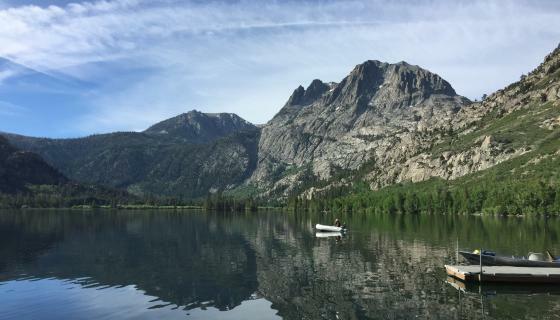 While there are hundreds of places to fish in the Eastern Sierra, few are as pretty, as well-stocked and easy to access and fish as Silver Lake. The natural lake is home to rainbow, brown, Lahontan cutthroat and the occasional brook trout as well as native tui chubs. Not only does the Department of Fish and Game regularly stock the lake, but the Silver Lake Resort also pays for supplemental stocking every season, with some trout in the 8 to 9 pound range and lots around 5 pounds. Since the lake is usually teeming with fish, it’s known to be productive for just about any fishing style, from throwing Powerbait and lures to pitching flies and night crawlers.